Need a sturdy bag to carry your stuff while riding your bike? 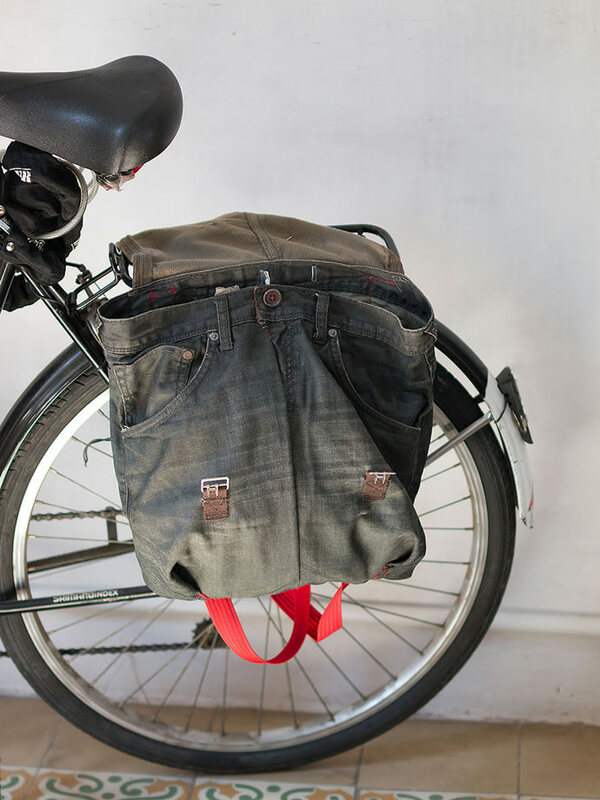 Upcycle an old pair of jeans or corduroy pants into a convertible bike pannier & backpack! 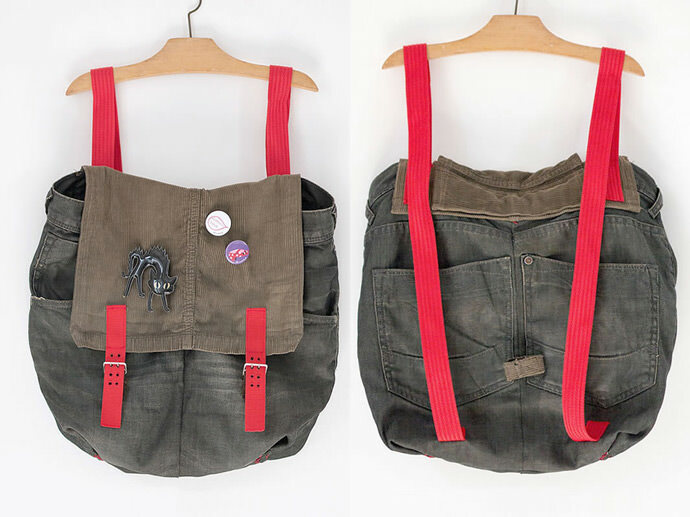 You just need an old pair of denim jeans or corduroy pants and some colorful nylon or cotton straps to make this super cool & versatile military-style bag. Don’t have a bike? 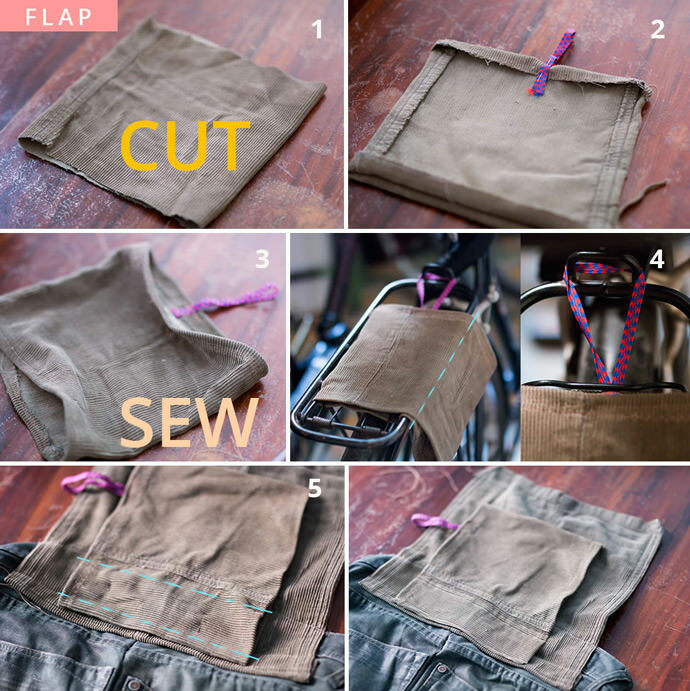 Simply omit the steps to make the spring flap band and straps for attaching the bag to the bike and you;ve got a great upcycled backpack. 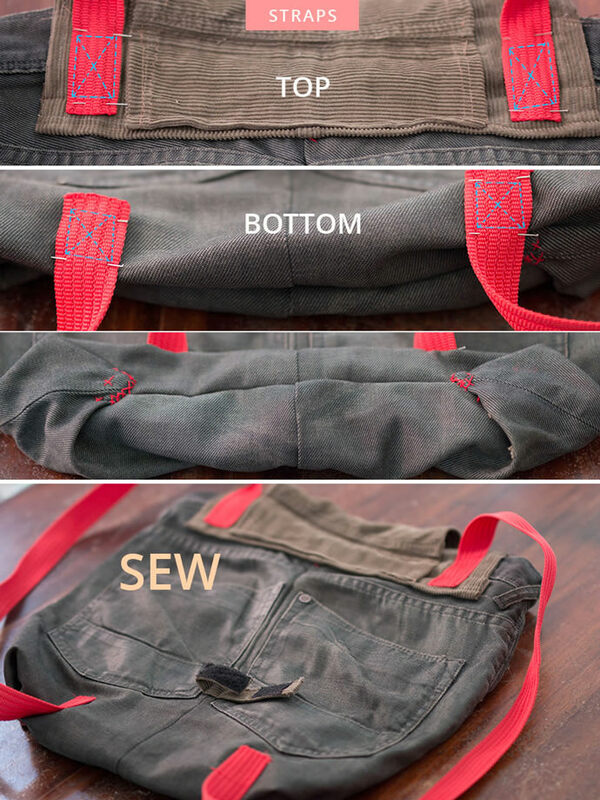 Choose the jeans or pants to use for your bag. One pair of jeans is enough to make an entire backpack, but you can combine different pairs of denim jeans or corduroy pants to get a different look. I used a pair of black denim jeans for my bag.. Guided by the length plus the bottom of your future bag (mine was 16.5 inches long) and leaving a double seam allowance (1-inch), mark and cut the legs apart. Cut through the crotch and around the inside leg. 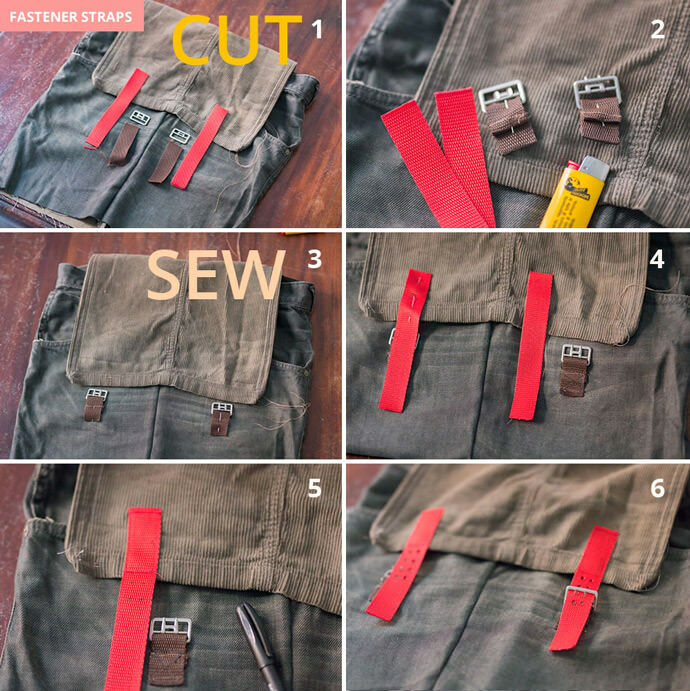 Flip the jeans inside out, then fold them sideways and mark one straight line perpendicular to the waist on each side. Remove the belt loop from the waist in the back. Leaving a seam allowance, cut away the excess denim. Remove the metal buttons from the front. Sew both bag sides following the marks. 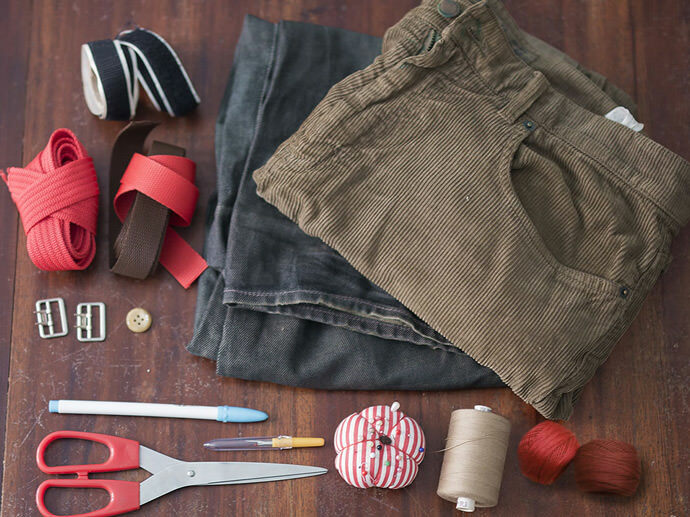 Take a piece of fabric from the bottom of the leg or from another pair of pants to make the top lid. Place the fabric on the denim bag to determine the desired length of the lid (mine was 9 inches). Add another 4 inches to the lid measurement to allow for a folded section that will be stitched to the back of the bag. Cut the leg to the desired length and open it. 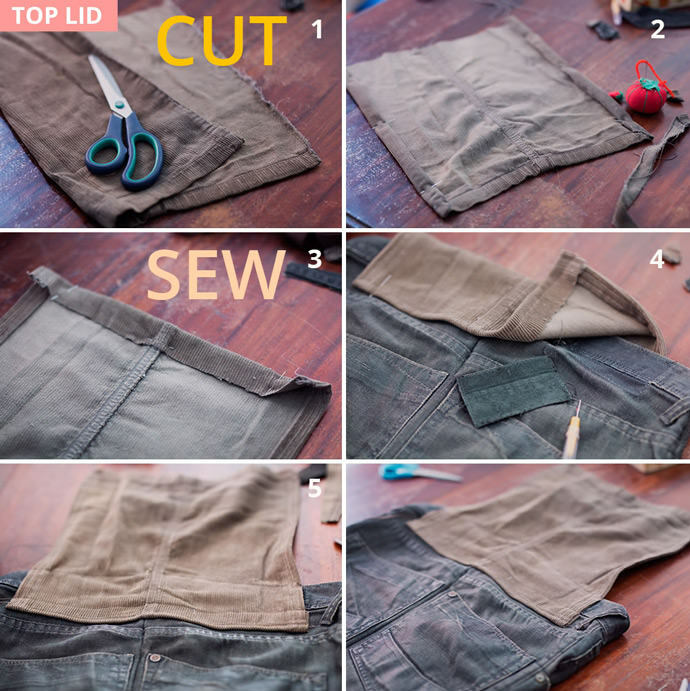 Use the bottom hem of the leg as the top of the lid piece. Fold, pin, and sew the rest of the hems. Fold and pin 3.5 inches of the top edge of the lid to the top back of the bag. Mark two lines along the waist and stitch the lid to the bag. 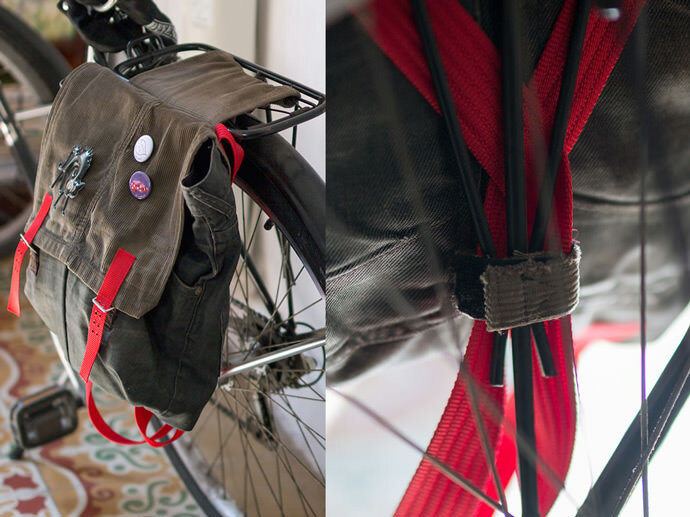 To attach the bag to the rear rack on your bike, simply pass the spring flap through the spring flap band. If your bike doesn’t have a spring flap, omit this step and sew two pannier hooks to attach your bag to the top tubing of the rack. Cut another piece of fabric from the pants leg 9 inches long for the flap band. Turn the fabric inside out and then fold and pin the edges. Optional: Add an 8-inch piece of elastic band to one of the edges. Test the flap band and elastic band on your rear rack, then draw a line marking any excess fabric on the band. Place the band on the back top of the bag. Align the band with the center of the lid top and draw a new line close to the edge. Stitch through the two marked lines. A second small band keeps your bag hooked to the bottom of the rear rack. Cut a 2-by-6.5-inch piece of fabric and a 1.5-inch long piece of Velcro. 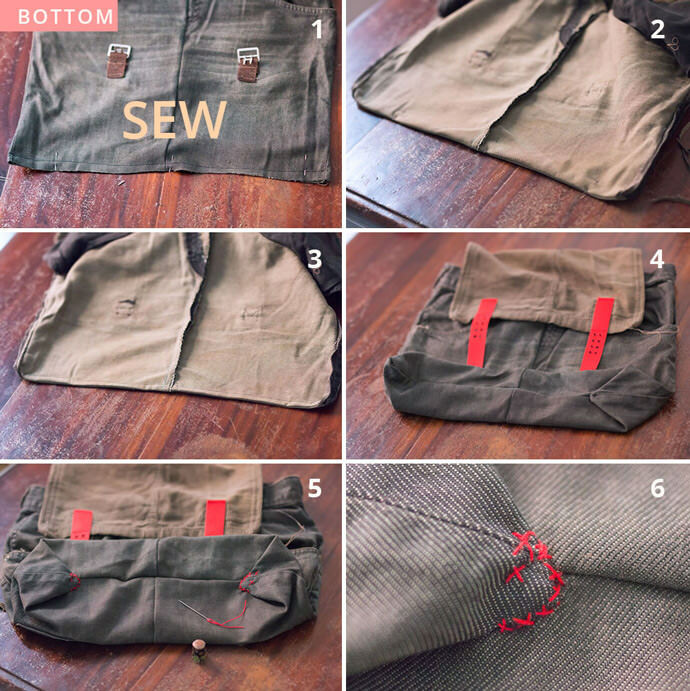 Fold and pin the short edges to make the hems, then fold the fabric lengthwise with the wrong sides together and sew. Pin the Velcro onto each edge. Stitch the Velcro to the band and mount the bag on the rear rack to mark the desired position of the band. Stitch the fabric to the bag (see the last photo of the photo sequence pictured above for reference). 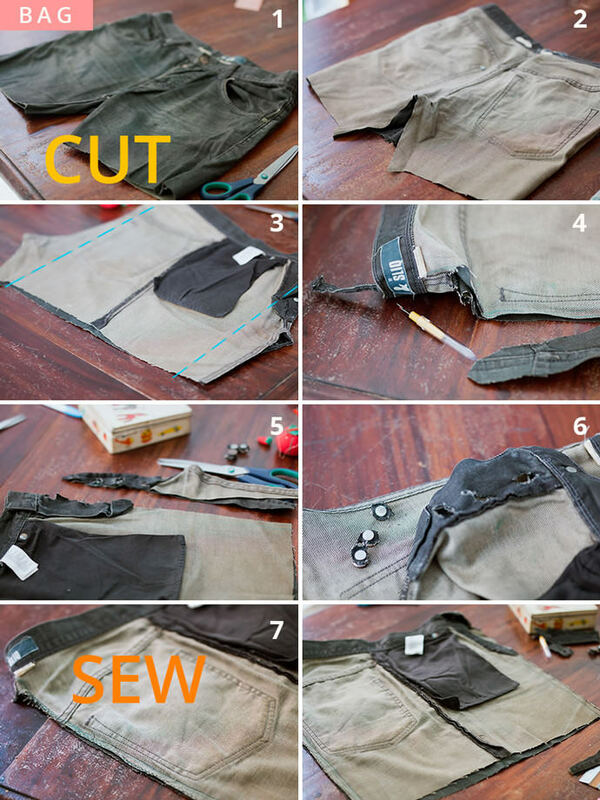 Cut away any excess fabric from the waist. Hand stitch the waist edges. Use a contrasting color of thick perlé cotton thread and make freestyle stitches to close the waist. 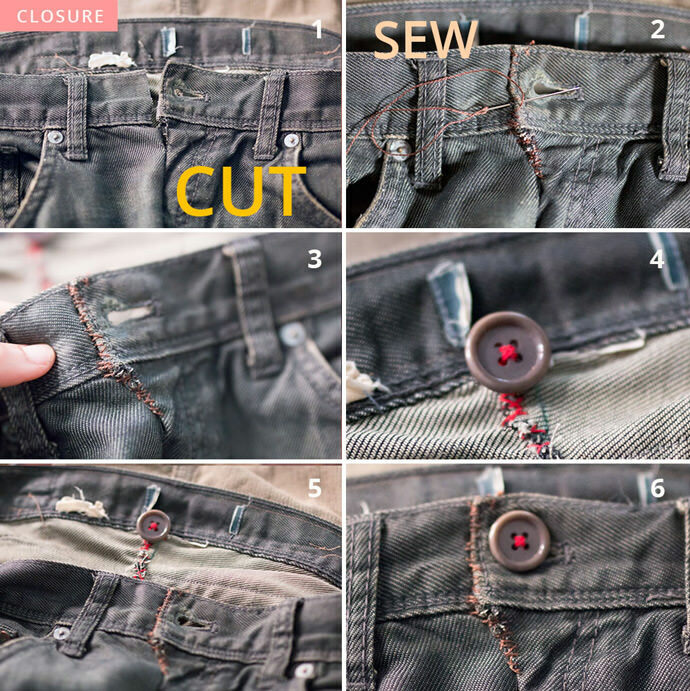 Sew one button centered at the inside of the waist. With the same thread, make straight stitches following the seam down. 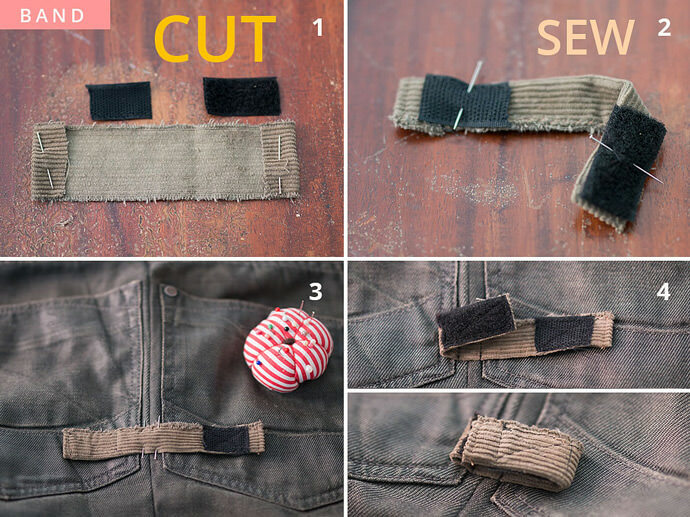 Cut two small pieces of the nylon or cotton straps 3 inches long and two additional pieces 6 inches long. Burn the frayed edges on the straps. Thread the straps through each buckle. Fold and pin..
Center the straps at the front of the bag right below the lid edge; pin and stitch them in place. Center the other straps at the bottom of the lid and align them with the buckles; pin them in place. Mark and poke holes. Use a screwdriver; soldering iron, or heated nail to make the holes. Align the bottom edges with the wrong sides together; pin and sew, trimming the seam allowance. Turn the bag inside out with the right sides together and pin. Stitch the bag bottom again, close to the seam. Turn the bag out and pinch together the bottom corners on the sides. Make a boxed bottom by folding the bottom corners down and pinning them. Work cross-stitches using perlé cotton thread to fix both corners to the bottom of the bag. Measure the back straps from any backpack you have and add 2.5 inches for the top seams and 1.25 inches for the bottom seams. My straps were 30 inches long. Pin 2.5 inches of the top strap with the edges centered at the lid. Pin 1.25 inches of the bottom strap with the edges at the back just above the boxed bottom of the bag. Test to see how the bag looks on your shoulder and correct the placement if needed. 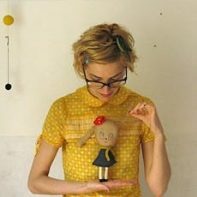 Draw rectangles on every edge and stitch around the rectangles. 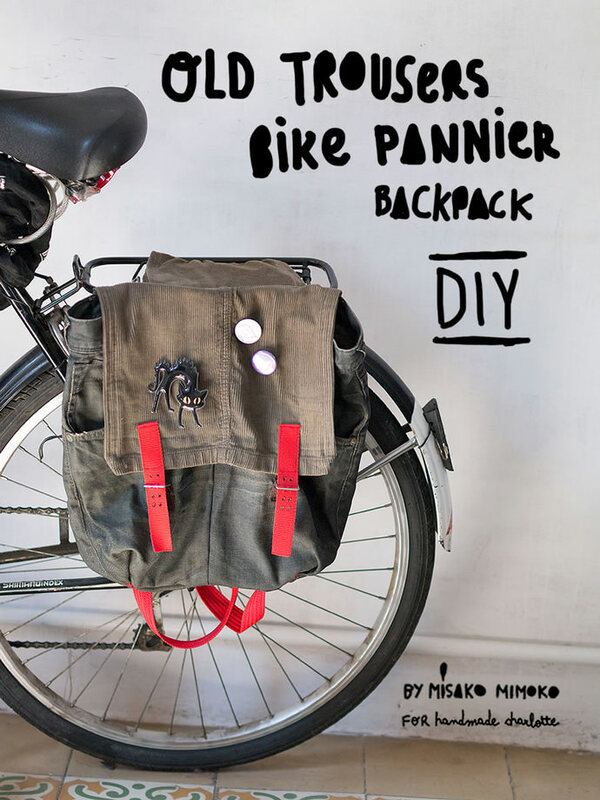 Your bike pannier is finished! Add cool patches, pins, or embroidery to decorate. Mount your bag to the bike rack using the spring flap. 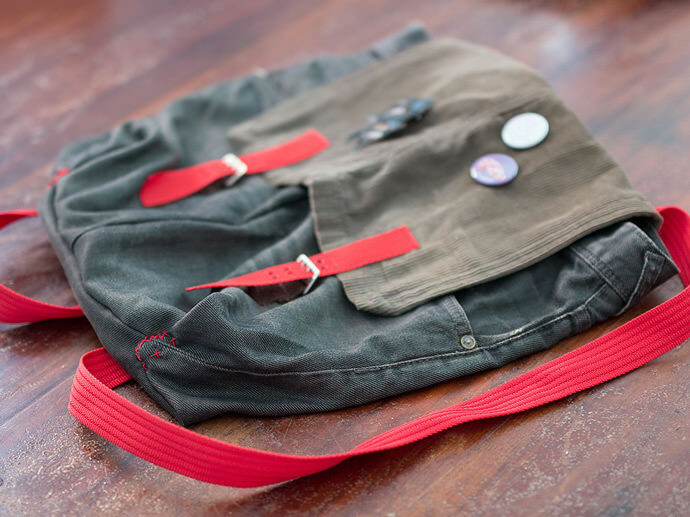 Keep the back straps in place by securing the Velcro band on the back of the bag to the rear rack bottom. Enjoy your ride and happy biking!